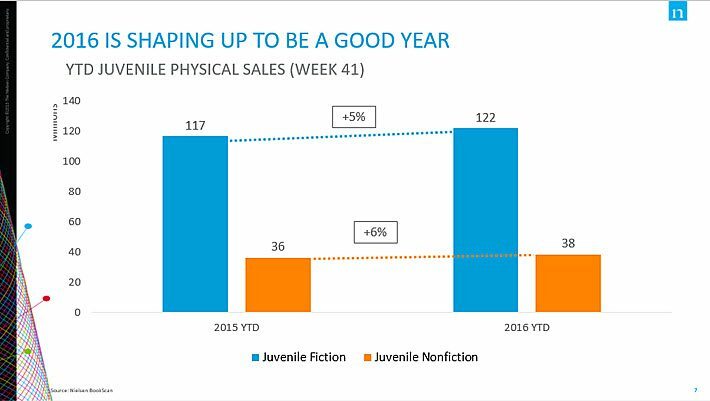 Taking a holistic approach, Nielsen’s third conference on children’s books looked at book sales, content trends, and buying habits of millennial parents. While the lack of a new Hunger Games blockbuster has worried many about the children’s book sector, Nielsen’s Children’s Book Summit on Thursday (October 27) was a upbeat affair, full of nuanced insights for publishing houses into where the young readers’ market is pointed. The third annual doing of this event was produced by Kristen McLean, Nielsen’s business development director, with her co-chair Kat Meyer. 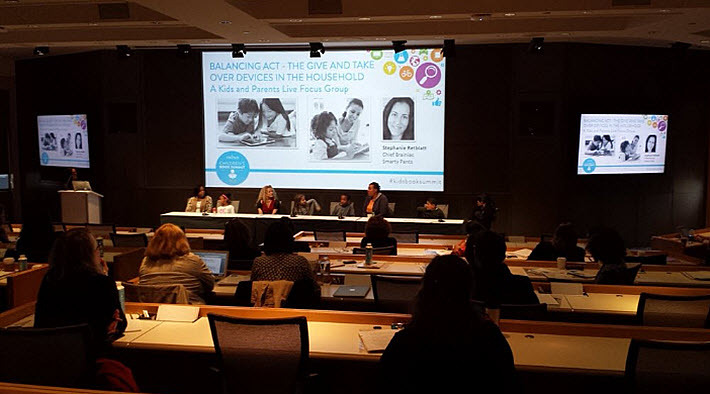 And in her opening overview at the Forum at Convene Center in New York City, McLean offered a hint of what was to come: “Books in the Age of Kid Empowerment” was contextualized around the influences that digital deployment and family engagement are making on each other. For both demonstrated clarity and sheer entertainment, one of the high points was Stephanie Retblatt’s presentation of her Smarty Pants research into how families are handling, “the give and take over devices in the household.” Four grade-schoolers and their mothers were on hand, a live consumer panel exploring what parents and kids think are priorities in handling the place and purpose of screens in daily life. Second-grader Sean, for example, quickly announced that he uses his smartphone to watch videos, yes, but also to “text my parents.” Concern about being in touch in emergencies ended up a key reason cited by parents for giving portable digital devices to their kids. What follows in many cases, it turned out, is a struggle between screen time and homework and what one mother termed hyperactivity and multitasking at very early ages by kids stimulated by on-screen entertainment. About 64 percent of the children’s book market is controlled by its top five publishers. The next group of some 20 publishers controls the next 25 percent of the market. Penguin Random House is about half the big part of the market, or some 32 percent. Sector-driven publishers, such as Christian houses, “are still getting really good traction, and there are opportunities there,” said McLean. Specialization, niche targeting appears to be a key factor in success. Leading categories in juvenile fiction are media tie-ins, holiday and celebration-related books—”families investing in high-quality togetherness” content, McLean said—and comics and graphic novels, per Nielsen’s data. “I think we may be headed for a robot trend,” too, McLean said, the research picking up “a lot of chatter” around robot narratives and interests at the moment. 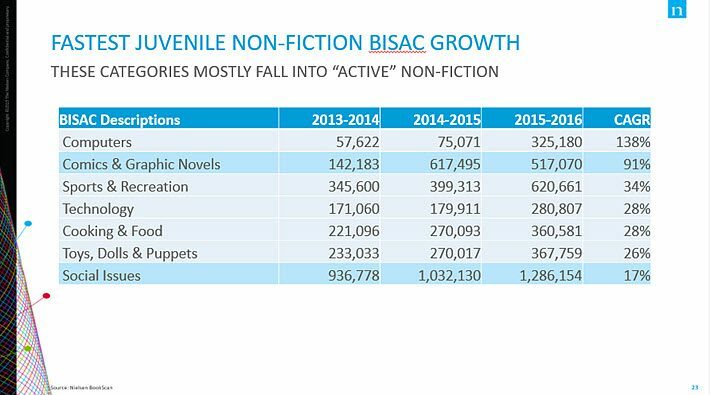 What McLean assesses as the real news in market trends for the children’s sector is in nonfiction, specifically, “what I’m starting to call active-nonfiction categories. Things that are about engaging kids’ interest, help them understand how to do things—things that seem kid-centered,” driven by what kids want to know about. The influence of YouTube remains bigger than ever, McLean said, including the Man-Can men-friendly-scent videos of Hart Main and the 4-year-old who opens toys on cam. YouTube, McLean told the conference, takes over as No. 1 activity draws by the time US kids turn 13 or 14, with books falling fast away at that point in the activities of surveyed children. “Girl power” continues to drive nonfiction, an example being the Kickstarted Good Night Stories for Rebel Girls project comprising stories of extraordinary women with illustrations by an international selection of female artists. Compared to the overall market, Nielsen looks back to 2005 and sees “stronger, more consistent growth.” In that time, the company cites the overall market having 21-percent growth since 2005, while children’s books in the US have grown some 52 percent. Ebooks in the children’s market, though, seem to have peaked in 2014 around a high number of film tie-ins. And while print juvenile content held steady from 2014 to 2015, McLean reports, ebooks registered a 33-percent decline in the sector without similar tie-in power to bolster them. Kleeman also brought forward a fascinating concept of “emotional scheduling” on the parts of kids whose receptivity to various forms of content shift according to time of day and place—home, school, etc. “Emotional scheduling,” Kleeman said, “is good news for classic content, trend-setters, and platform operators,” parts of the market that reference tradition, habit, stability. One of his best examples is a Danish kids’ television channel that at night shows loops of its characters—asleep. And while sessions to come would focus on the plethora of content in the market today—especially good in a conversation between Sourcebooks’ Dominique Raccah and Knopf Young Readers’ Jennifer M. Brown—one of the day’s most compelling presentations came late, from Nielsen Entertainment’s Jordan Rost, vice president for consumer insights. Titled “The We, More, and Now Generation,” Rost’s analysis looked at behavior associated with millennials and what might be inferred about them as children’s book-buying parents. “People are, in fact, delaying when they progress through various life stages,” he told the audience. ” Millennials, who may represent some 24 percent of the world population today, Rost demonstrated, tend to start families more frequently in their thirties and, in some cases, live with their parents longer. Their preferences tend toward consumer-driven convenience; an ability to accommodate both digital developments and traditional informational and entertainment contexts; they frequently like instant gratification, health-conscious offerings, and new things or experiences outside their own culture, an openness that should be passed down to children. “The construct of three meals a day, for a lot of [millennnial] consumers,” for example, Rost said. And yet networking with other people and social structures is important. 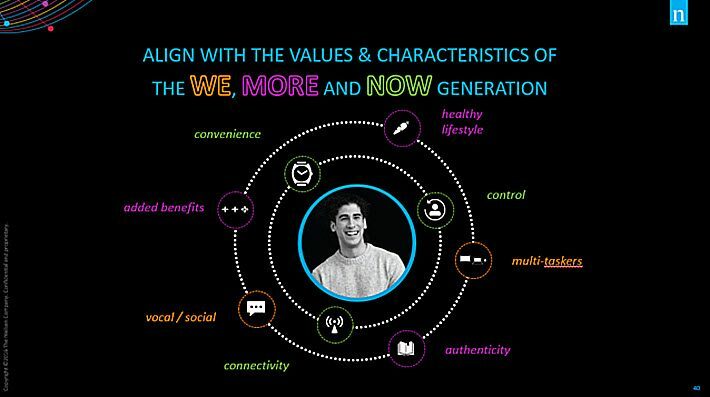 Rost talked of “a push toward mindfulness, having conversations face-to-face, and have more analog interactions” as a core element of millennial interest, which might argue for the kind of pushback against digital seen in some young family settings today. Overall, Rost said, here’s less black-and-white separation for this generation of parents between the on- and offline worlds. There’s a blending underway here of traditional and innovative concept, and an energy there that’s likely to be reflected going forward in how millennial parents introduce reading to their children and advocate for a place for books in their kids’ lives. Rost, himself a millennial, advised publishers, “It’s really crucial that you engage with the network, the social network” that means so much to this participatory sector of the population, as many in the video world have done. “Being able to build off of what’s in front of the child of a millennial parent may mean augmenting that experience,” he said. 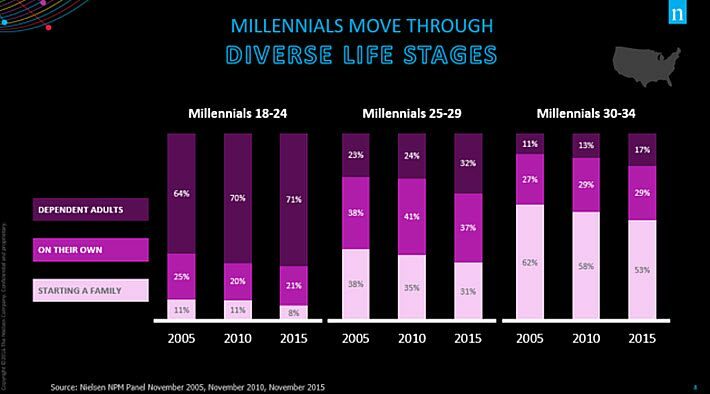 “There’s a sense of autonomy” in millennials, he said. “There’s an openness you need to have, empowering people to make the decision,” themselves in commercial settings. And that, of course, includes choosing reading material for kids.